It was hot that morning, but then it was always hot, or at least it had been since we had gotten in country. We had been in Viet Nam for a little over a month and with the exception of a couple of snipers, (that turned out to be no more than kids not yet even teenagers) we had yet to see any real action. Captain Ketterly had been our company commander state side. He had been an enlisted man in WWII and also in Korea, but had worked his way through the ranks in the reserves. When reaching 2nd Lt., he requested full active service. Now he was in S-2; that was Army Intelligence. Most of the enlisted men considered that moniker, a misuse of the English language, or at the very least a contradiction in terms. Today we would consider it an Oxy-moron. None-the-less, every man in the company, if not battalion, held him in high regard. We really were not in a hurry to see any real action, but that would come soon enough whether we wanted it to, or not. LZ Xray and LZ Albany was still a couple of months ahead of us. We were the Black Knights and supposedly, the sister battalion to the Seventh Calvary, General Custers battalion. There had been some friendly rivalry between the 2 battalions but I don’t think anyone but the officers took it too seriously. Let me explain that message. We were on our own frequency that day and could not call in Med Evac without changing frequency. As a unit, we had to get permission before an individual radio could be taken out of the system and put on a separate frequency. Almost every unit over there had their own frequency they operated on. (Those changed daily or weekly.) If you were working in a platoon unit you would have one frequency and if you were operating as a Battalion you would be on a different frequency. Think about it. It just makes sense. Six (6) designates the commander of the unit, and anything before or after that designates something under the command. At that time we were the only company on that frequency therefore, 6 was our captain or command. Two (2) indicated the 2nd platoon, and India indicated that particular command’s radio operator. Everyone in the company knew that the 2nd platoon radioman had been wounded. It was really a simple system. One nice thing about the Prick 25 was that you could get almost any frequency of any unit in the whole country and listen to what they were doing. That could be a bad thing also, because “Charlie” (Victor Charlie, Viet Cong, NVA [North Vietnamese], Enemy) could also listen in if he had a captured radio and frequencies. Often, they did. Now you can understand why we changed frequencies so often. The other thing the Army did, was talk in codes. Instead of asking for a hamburger and fries you might say I need some cats and dogs. Instead of hand grenades you might ask for tulips. Those codes changed daily and weekly also. I think you can understand why. Back when we had been in country less than a week, the radio personnel from the company had a meeting with the company XO (executive officer). While we were waiting for Lt. Strong, we got a call from 2-6 India requesting some ammo for the M16s and M60’s. We did not recognize the voice, but he had all the codes right, and was using proper radio rules. Problem was that I was looking at 2-6 India and his radio. That meant it was Charlie calling wanting some ammo or just setting up an ambush for some newbies. We had the 4th platoon radioman with us also. The 4th platoon was a mortar platoon (a mortar is a tube 2 to 5 inches in diameter into which you drop a self-propelled grenade round that explodes when it comes back to earth. An experienced mortar squad can hit a 50-gallon drum over a mile away. They are very heavy and a platoon will have 3 or 4 tubes and as many base plates, which are heavier yet.) After getting the co-ordinates of the fake 2-6 India the 4th platoon simply sent a mortar round to that location. There was an explosion some distance away, and we never heard that voice on the radio again. That was when the radiomen in our company got together and decided on a code of our own. We had all trained together stateside for over a year before being sent to Viet Nam and all knew one another fairly well. That was true of the whole battalion for the most part. When President Kennedy was shot we all received our draft notices right afterward. Most of us were US numbers as opposed to RA numbers. A US number designated a soldier that had been drafted while an RA number designated a soldier who had enlisted. A drafted soldier had an obligation of 6 years--2 years active military, 2 years active reserves (monthly meetings and 2 weeks a year in training someplace [weekend warriors]), and 2 years inactive reserve. (While inactive, you could still be called into active service). We were about 60% draftees and 40% Regular Army (RA). The RA or enlisted soldiers had 3 years active service and 3 years active reserve. As we had trained together for more than a year after basic training and AIT (advanced infantry training) and knew each other well, we decided in the company and later the battalion to set up our own code. If you were talking to someone in the company we would talk in codes that we had used stateside, not the ones that you had given to you for that day or week. It was understood among us that if you answered in the same code you would be considered Charlie and if you gave your location you would be fired on. It was real simple. If you did not know all the codes we had used stateside, you could not talk to us and be considered friendly. If you figured out the code the person who was talking to you was using and you answered with that code and not another one you were not one of us and would be considered the enemy. It worked so well for our company, some of the other companies in the battalion started using it. When you were talking to battalion or brigade or higher you had to use the current code that they had passed out for that day or week. It was a real simple system as long as you had trained with us for the past year or so. You knew all the codes and were considered friendly. The first time I used it, the Lieutenant about had a fit, until I explained it to him. He wasn’t real sure how it would work, as he was a newbie to us and had been assigned to the platoon when we were in-country. The platoon sergeant understood it, and knew the reason for it, so we continued. A lot of the officers we had trained with moved up or around to different jobs both in the battalion and brigade when we got in country, so many of the officer’s left in the unit were new to us. Not that they had not been trained to a standard past excellence, they had, and were very good at their jobs. They were just not the ones that had trained with us and it took a few minutes to know their names and get used them. Lt. Strong was our XO, and was one of the few officers we had that had been in that position state side. He was a by-the-book officer, who was looking to make a career out of the army. He was well respected by the enlisted men under him, if not well liked. He was a good training officer, and tolerated few mistakes. If you were not paying attention or horsing around in one of his training sessions, he would call you out in a heartbeat. He did not tolerate any mistakes, not even the first one, and he was not real friendly with the enlisted men. That changed the day we got in country. At least the perception of those officers who had been like that, changed. They seemed friendlier and we, as enlisted men, tried to give them more respect. There were several reasons for that, not the least of which was that we all knew that we were dependant on each other to stay alive. The officers had to make the right decisions at the right time, and the enlisted men had to carry the orders of the officers out without question. An officer did not have the time to tell you why he was asking for something, and by the time you would have questioned it, you could both wind up dead. It was no longer the game that it had been state side. Now you were playing for your very survival and that of the people you had trained with for the past year to year and a half. Nui Hong Cong was a mountain just to the west of Ahn Khe. That is where we built ‘The Golf Course.’ That was a runway for both fixed wing and rotary wing (helicopter) aircraft that we had built the first week we were in country. The reason it was called The Golf Course is because we built it with entrenching tools. That is a short shovel that folds and can be carried at your side in a case. It can be straightened out like a regular shovel, or turned 90 degrees and used like a pick in hard ground. When you are using it like a pick, it almost looks like swinging a golf club. Well not really, but that is how “The Golf Course” got its name. We had been on short patrols to the south and to the east of our base camp. It was not really an army installation yet. That would come later, in fact after most of the drafted personnel were gone back to the real world. Someone decided that we needed to send a patrol out to the west, and one to the north along Malaria Valley. How Happy Valley and Malaria Valley ever got those names I have no idea, but I can guess. Happy Valley is close to where the Viet Minh defeated the French. So it was that we went out, bright and early on a cool Monday morning. 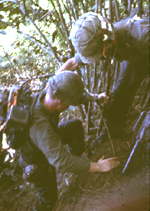 It was only 85 or 90 degrees and Lt. Strong took the 2nd and 3rd platoons on a stroll north through Malaria Valley. I was not very happy about this, as I had been up the night before enjoying some Tiger Beer. It was a French beer with the picture of a Tiger on the quart bottles that it came in. I was listening to Andy from the 2nd platoon play his guitar until well after midnight. It was now almost 5:30 AM (0530 in military terms) and I was not in the mood for a morning walk carrying a 25-pound radio along with 140 pounds of equipment and rations. Hell, I only weighted about 130 pounds at the time. At any rate, we had finished a breakfast of scrambled eggs, SOS (if you don’t know what SOS is ask anybody that has been in the military) and greasy bacon. We were now starting north out of camp with 2nd platoon and 3rd platoon the ‘lucky ones’ that morning. The patrol was scheduled to go north to the point where the mountain to the north west of Nui Hong Cong and then along the north side of that mountain as far as the mountain went. It seemed like 40 or 50 miles or more when you were walking.